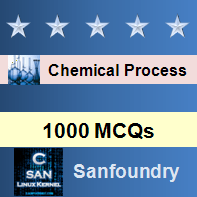 This set of Chemical Process Calculation Multiple Choice Questions & Answers focuses on “Material Balance without Reaction-IV”. 1. Distillation is a separating process based on __________ of liquid mixture. Explanation:. Distillation is a separating process based on Vaporizing of liquid mixture. 1000 Kg of feed is given to the column and the efficiency of the column is 10%. 2. What is the amount of product? Explanation: Product in Kg = 1000*0.1 = 100 Kg. 3. What is amount of CH3OH in the feed? Explanation: CH3OH in the feed = 1000*0.2 = 200 Kg. 4. What is amount of H2O in the feed? Explanation: H2O in the feed = 1000*0.8 = 800 Kg. 5. What is amount of CH3OH in the product? Explanation: CH3OH in the product = 100*0.5 = 500 Kg. 6. What is amount of H2O in the product? Explanation: H2O in the product = 100*0.5 = 500 Kg. 7. What is amount of CH3OH in the waste? 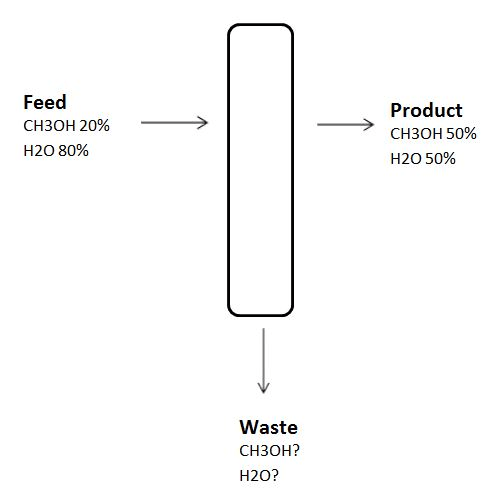 Explanation: Waste = Product – Feed. 8. What is amount of H2O in the waste? 9. 50 Kg of a solid liquid mixture containing 10% solid and 90% water is left open in atmosphere, after some time the water is 80%, what is the weight of the mixture now? Explanation: Make solid and water balance. 10. How much water was evaporated? Explanation: Evaporated water = Initial amount of solution – Final amount of solution.